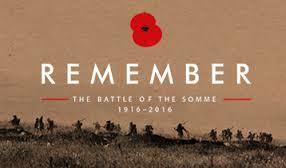 Tomorrow, Friday 1st July, marks 100 years since the first day of The Battle of The Somme. On the first day alone we lost almost 60,000 British soldiers. By the end of 141 days of horror the British Army had suffered 420,000 casualties, the French lost 200,000 men and the Germans nearly 500,000. If you can please take time to remember all of those from all sides who were in this bloodiest of battles and all those that lost their lives. The history of this First World War battle can be found here http://bit.ly/29bMhUy .